Does the recent announcement by the Australian Communications and Media Authority (ACMA) of a new code of practice to prevent bill shock for “long-suffering telco customers”, and improve product marketing practices, bring Australia up to par with its international cousins? Bill shock, as the name suggests, is the reaction customers have to unexpected charges on their mobile phone bills. A public enquiry held by ACMA, with the final report released in September 2011, found that telecommunication companies write off up to A$113m annually in bad debts related to bill shock. The latest ACMA announcement is a major step forward but the government and ACMA have to act urgently to fix the great Australian mobile rip-off. The problem of the international roaming charges rip-off is yet to be directly addressed by either. Have you heard about “data share” and why it is being promoted as a major step forward by Verizon Wireless USA? No? Read on and learn how Australian telecommunication companies are ripping-off mobile users with excessive data charges and failure to implement more flexible multi-device accounts. After several years of record complaints to the Telecommunication Industry Ombudsman (TIO) ACMA finally decided to act. Its 102-page code of practice – Telecommunications Consumer Protection (TCP) – will be enforced from September 1 and phased in over the next two years. The telecommunication industry body Communications Alliance prepared the code after ACMA indicated it was not going to “roll over” to industry resistance for change. My own discussions with the chief executives of the major telcos have convinced me that they get it [the need for a code of practice]. I think they know that in this increasingly technology driven environment […] there is only one outcome for them — that is to change their business practices and to own their customer is a way that is materially rewarding. [We] are hopeful that its [the new code of practice] adoption will result in clearer advertising, easier comparison of products, better information about contracts and better tools to help consumers avoid bill shock. The ACCC, for example, has much stronger powers and its issuing of fines has sent a strong message to the telecommunications industry that its advertising cannot be misleading. Verizon Wireless USA has introduced “data share” – an initiative under which customers share their plan’s data allowance across multiple mobile devices, including smartphones and tablets. The Verizon Wireless data-share plans have been described as expensive for US mobile customers, but a sign of the future, as American telecommunication companies try to wean customers off unlimited data plans in the move to 4G networks. Let’s compare Telstra’s current offering with the Verizon Wireless data share plans – bearing in mind Telstra Mobile leaves the Australian competition in its wake for cost, coverage and network quality. The current Telstra unlimited talk/MMS, text, with 3GB data plan costs A$100 per month. For three devices on the Telstra network, the cost is threfore A$300 a month, with 9GB of data – 3GB per device, that cannot be shared. The Verizon Wireless unlimited talk, text and share data plan with 4GB data will cost US$40 (A$40) a month for a smartphone and US$70 (A$70) a month for 4GB of shared data. For a Verizon Wireless account with three devices (two smartphones and one basic phone) sharing a monthly allowance of unlimited talk, text and 4GB of data would cost US$180 (A$180) a month (excluding taxes and surcharges). To get a comparison we need to add 5GB of data to the Verizon Wireless plan. 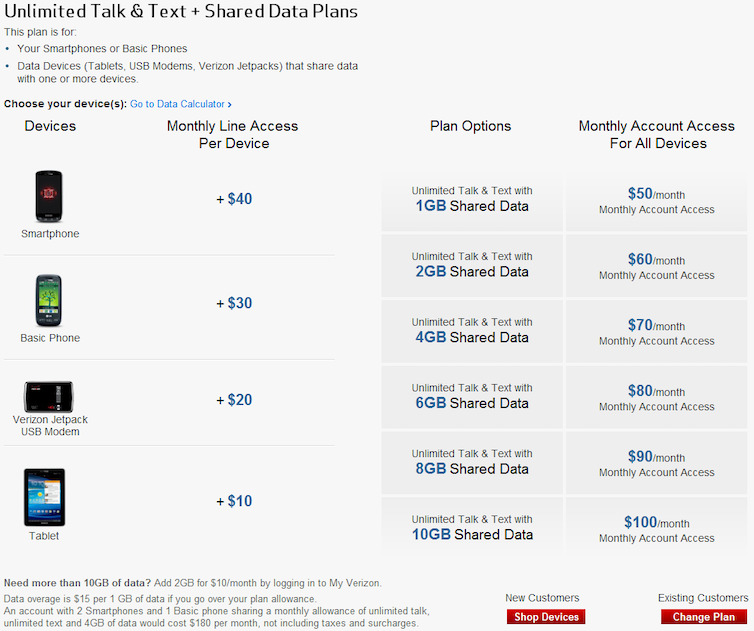 Verizon Wireless charges for extra data at a rate of US$10 (A$10) a month for 2GB. For an additional 6GB of shared data a Verizon Wireless customer would pay US$30 (A$10) a month. So the total cost to the Telstra customer is A$300 per month for three devices and 9GB of data that cannot be shared across devices; the total cost for the Verizon Wireless customer is US$210 (A$210) for three devices and 10GB of data that can be shared across the devices. One of the most frustrating aspects of mobile devices is paying for data that’s not used one month and then paying an exorbitant amount for going over the plan allowance the next month. If you use more than this [your agreed] amount each month you pay for that extra browsing at a reduced Pay As You Go (PAYG) rate – so you get more for your money. Yet the Telstra additional usage charges are described as A$0.10 per MB used, which means A$100 per GB used. To put that in context, a standard ten-minute YouTube video is about 25MB in size, so would cost the customer A$2.50. The old arguments in defence of high data charges in Australia cannot be justified. Telecommunication companies in the US and Australia have mature 3G networks and have commenced rolling out 4G (LTE) networks targeting areas of high population density initially. Technology costs have continued to fall. Backhaul, core and international bandwidth costs have continued to fall and are now similar to costs in the US and Europe. Verizon Wireless’s additional usage charges are described as US$15 (A$15) per 1GB of data whenever customers go over their plan allowance. A Telstra customer with three devices will pay A$85 (US$85) per month more than a Verizon Wireless customer for a similar plan – and for a 1GB data overage, a Telstra customer will be charged A$85 (US$85) more than a Verizon Wireless customer. Add to this injury the advantages of data share enjoyed by Verizon Wireless customers. The Verizon Wireless customer will be able to share data use across their multiple devices; by doing so they will be better able to manage data use and potentially reduce the plan cost by moving to a lower shared-data plan. For Australian families shared data plans are a must. It’s time for the government to act and force telecommunication companies to introduce shared data plans immediately.